John Whitehead is a professor in the Department of Economics at Appalachian State University, arriving in Boone in 2004. He received his PhD from the University of Kentucky in 1990 and has worked at East Carolina University (12 years) and UNC-Wilmington (3 years). In addition to two sections of economics principles each semester, he has taught benefit-cost analysis, environmental economics, international economics and senior seminar whilst at AppState. John's research interests include finding better ways to attach monetary values to environmental and natural resources for use in benefit-cost analyses (e.g., sea-level rise, recreational fishing). 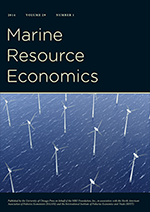 He is an Associate Editor at Journal of Environmental Management and Marine Resource Economics. He is a member of the SSC of the SAFMC and the past-president of the Socioeconomics Section of the AFS. Previously he served on the Board of Directors of AERE and as the AERE webmaster. He has been blogging at Environmental Economics since 2005. He was presented with the 2008 Distinguished Economist Award by the Kentucky Economic Association and, perhaps most importantly, he was elected "Player with the Best Attitude" in the Noon-Time Faculty-Staff Basketball Game.